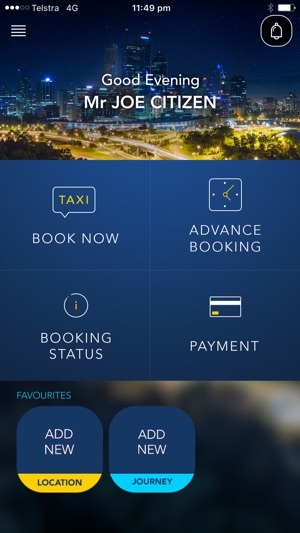 The ComfortDelGro SWAN TAXIS App is the ideal taxi booking and taxi payment application for individuals on the go. This user-friendly application comes with enhanced features to make booking a taxi effortless. The application provides a new experience with improved features and benefits which users can discover their own personalised greetings and the ability to pre-set their favourite locations and journeys. It even allows users to book a taxi at their current location, determined by their phones’ GPS. What’s more? The application offers assurance and control for users – empowered with the knowledge of their taxi number, taxi tracking and fare estimation. For extra assurance, the users can now share their trip details with family and friends. The users will enjoy the ability to rate the driver and provide feedback on their trip or experience instantly to SWAN TAXIS. Get started and enjoy the convenience of taxi booking at your fingertips. - Eliminates higher fares resulting from traffic and weather events. 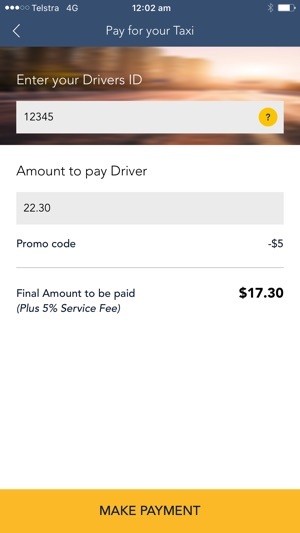 - Pay for your taxi using the app, even if you hailed a taxi on the street. - Enter a promo code when creating your taxi booking and enjoy significant savings. - Automatically detect current location using GPS as pick-up address. - Add notes to driver. - Preset and retrieve favourite locations for booking. - Preset and retrieve your favourite journeys with trip details (pick-up and destination addresses) for booking. - In-app push notification for all taxi bookings. - Location tracking for confirmed taxi booking. - A list of 10 completed bookings for the past 30 days is available for reference. - Re-book from your previous trips. - Receive an eReceipt directly to your inbox. - Rate your driver after each completed trip. - Share your taxi experience with us via the survey and feedback feature. 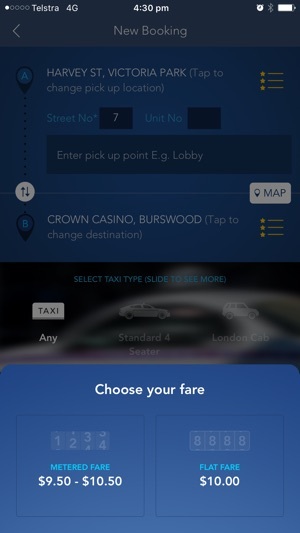 ComfortDelGro SWAN TAXIS Booking application can run on iOS7 above. SWAN TAXIS was established in 1928. 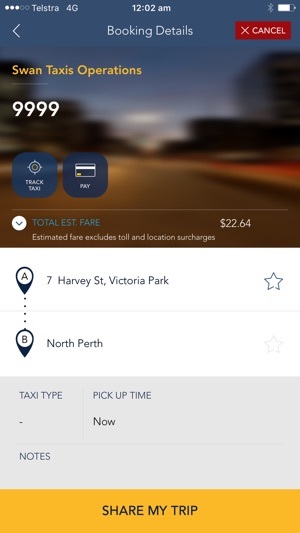 SWAN TAXIS is the largest Taxi Dispatch service in Perth with the largest fleet of taxis and drivers. SWAN TAXIS is fully owned by ComfortDelGro, one of the world’s largest land transport companies. Headquartered in Singapore, the Group also has operations in China, the United Kingdom, Ireland, Australia, Vietnam and Malaysia. 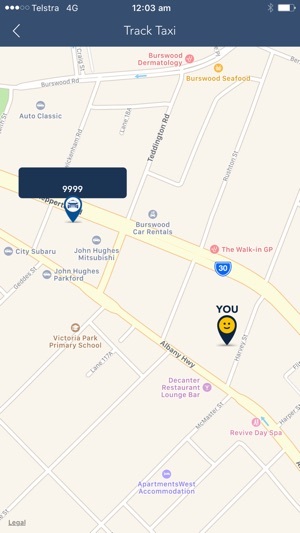 I needed to get to the airport with young kids and used this app to book the taxi the night before. The taxi turned up on time. - it’d be nice to get a text message or something confirming the booking has been received, instead you get a confirmation screen BUT that circular animation makes it seem like things are pending or something hasn’t worked. I just kinda went to bed.. unsure. But in the morning I was still a bit unsure because that circular animation was still spinning. Nervously, I called the number only to have an automated message tell me a taxi was booked. Phew. But still that could have been avoided with a simple confirmation. - setting the address manually needs work, that was quite confusing. - there’s a design research method called ‘usability testing’. They do that kind of stuff at Uber. You should google it. It’s pretty clear this step has been skipped. After reading some reviews, I was hesitant to use this ap, but I'm glad I did. It knew where I was so I didn't have to find out, it tracked the driver, told me when he was nearby and gave me the choice of a set rate or the meter rate. Both drivers today were very friendly and helpful. I can highly recommend this ap and company.